I recently had my wedding reception at Bar Vasquez (formerly PAZO) -- and we had the absolute best experience! The beautiful space was the perfect backdrop for the evening. As it is a Foreman Wolf restaurant you can expect the food to be outstanding and it truly was. The main point of contact for private events is Charisse Nichols and she is a joy to work with. She was prompt to answer any and all questions, and was very accommodating in regards to scheduling walk-throughs with other vendors and our tasting. They have several event menus ready to go but are very flexible with alterations, and work with you to make sure that you are keeping to your budget. During the event they do hourly checks that help keep you on track with that as well! In addition to the beautiful venue and amazing food, the staff was absolutely wonderful. They were professional, polished, and maintained a perfect balance of being available but not in the way. They made the event feel first-class and ensured that every guest were taken care of. I could not recommend Bar Vasquez enough and am already excited about the next time we go there just to eat dinner!! Thank you Bar Vasquez for the perfect evening!! Where to begin, there are so many amazing thing to say about Pazo and the people that work there that I am sure I will forget to mention some of them. I fell in love with Pazo when I lived in Baltimore and knew it would be the perfect venue for my wedding reception. The European flair coupled with the amazing chef and food was why I chose Pazo. My husbands family is from Naples Italy so the newer southern Italian menu did not disappoint. After I decided Pazo was the place for my wedding I began to work closely with Charisse to plan the perfect event. Chasrisse is a true professional and an asset to Foreman Wolf. She made planning so easy and was so quick to respond to all of my requests. She made every step of the process the most enjoyable and memorable experience. I cannot have imagined my bid day without her! I cannot leave out Kevin, he also had a hand in making my day magical. He pulled out all the stops and created signature cocktails that left everyone thirsty for more. I just can't rave enough about the venue, the food, the employees, the attention to detail... I could go on and on. Pazo will forever hold a special place in my heart. It is a 5 star restaurant with 5 star customer service and 5 star food. If you are considering Pazo for your next event, stop considering and book it, you will not be disappointed! 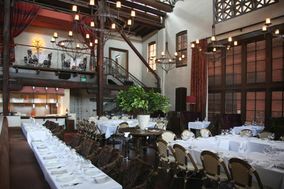 This past December I hosted my son's rehearsal dinner at Pazo and I must say, the event was wonderful. From the moment I contacted Pazo (in the person of Charisse Nichols) I was put at ease, know that I was in the hands of professionals. Charisse made the job of hosting the event a pleasurable experience for me, listening to my needs and assuring me that my dinner would be top-shelf. On the night of the dinner, I arrived and was swept up by extremely attentive service, wonderful food and just a really great room in which to host. The emphasis on quality at Pazo runs from top to bottom. Can't wait to do another!! Charisse was our point of contact throughout the entire planning process, as well as day-of, and she was an absolute breeze to work with! We did most of our communicating over email, and she almost always got back to our questions on the same day. She was very accommodating, and was happy to be flexible with all of our specific needs (we were really insistent on this one dessert that wasn't on the menu, and she got the chefs to practice making it especially for us). The restaurant itself is simply stunning–so much so that we hardly needed to decorate at all. The entire place was bathed in gorgeous sunlight, and the fabrics, ornate railings, chandeliers, wooden beams, and pottery gave the place such a unique look–really unlike any of the other venues we visited. The two stories were so fun to play around with–we made our entrance down the stairs onto the dance floor, and were able to cut the cake and throw the bouquet from up on the second level. There was plenty of space for all of our guests to dance. PAZO is primarily a restaurant (not a "wedding factory"), so the food is spectacular. We did buffet-style dining, and the servers did an excellent job of moving the guests through quickly so that everyone was able to eat around the same time. The staff went above and beyond for some of our vegetarian and vegan friends. For drinks, we had the main bar area (which was filled with couches people could relax on), as well as two extra bar areas–no one had trouble getting a drink! All of the staff were incredibly professional and kind, so much so that even our guests were commenting to us afterwards how impressed they were with the service. Our guests loved the space, and are still raving about it to this day! Do yourself a favor and check this place out one night for dinner–I guarantee you'll fall in love with it.